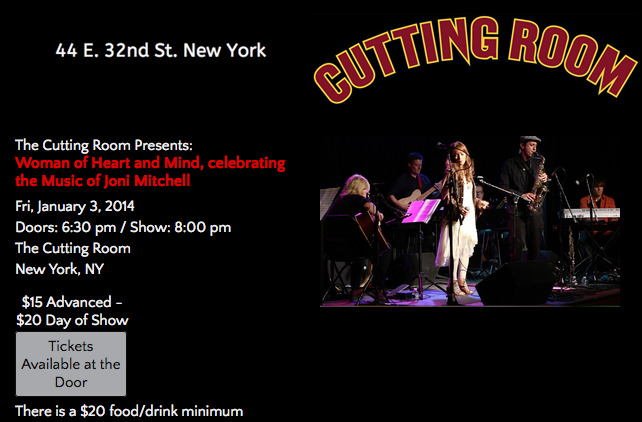 Ring in the New Year with us on January 3 at 8 PM The Cutting Room! New York vocalist and pianist Hannah Reimann and her 5-piece band honor the iconic career of the incomparable Joni Mitchell with a selection of songs from the composer's 1968-75 catalogue, her most influential period. Joined by Scott Chasolen (of the Machine) on keys and piano, Michele Temple (of Pere Ubu) on acoustic guitar, Thad Debrock on pedal steel and electric guitars, Rob Calder on bass, Doug Yowell on drums and Gina Yowell-Gerszberg on backing vocals, Reimann will also play a number of tunes on an Appalachian mountain dulcimer, the instrument which Mitchell wrote and performed many songs on her acclaimed album, Blue. This show will also include selections from the albums Clouds, Song to a Seagull, For the Roses, Court and Spark and Miles of Aisles. A 70th Birthday Tribute to Joni Mitchell- Please buy your tickets now! We are very excited about this special event! Hope to see you there! A 70th Birthday Tribute to Joni Mitchell! 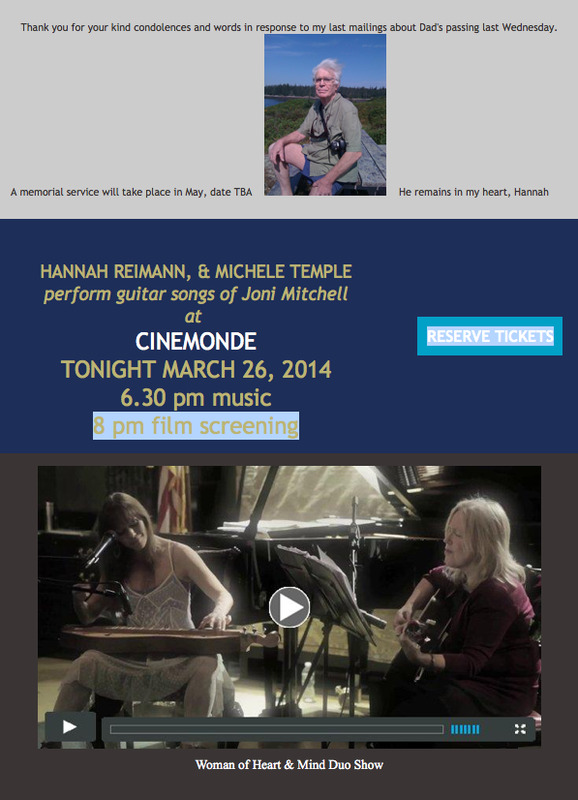 "Women of Heart and Mind - A 70th Birthday Tribute to Joni Mitchell"
Hannah Reimann Vocals & piano with 7-piece band will be performing songs by the one and only Joni Mitchell in various venues in the area so, keep an eye on the event calendar and and the Women of Heart and Mind Facebook page!